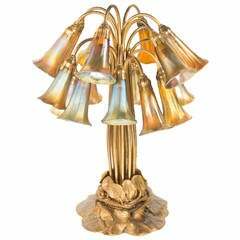 An American Art Nouveau patinated bronze and favrile glass "Twelve-Light Pulled Feather Lily" table lamp by, Tiffany Studios. The patinated bronze lily base is decorated with twelve stems emerging from a pond lily base further decorated with tiffany favrile blown pulled feather "lily" shades emerging from the stems. The lily shades are decorated with green iridescent pulled feathers against an opalescent white background. The shades are signed, "L.C.T." and the base is signed, "Tiffany Studios New York 382".